Are you familiar with Captain Nemo and his voyage under the sea? Click here to play! Well, now is your chance to jump right into this classic tale to experience the adventure while collecting your own sunken treasure. All aboard the yellow submarine! This underwater vessel, along with the 20,000 Leagues logo are wild symbols. They only appear on selected reels, but they will substitute for most other symbols to help you bring in the big wins. Keep your eyes open and your ears open for Captain Nemo. He’s in charge of this voyage and will pay out a massive 5000 times your line bet if you can spin five of his symbols across an active line. Also watch out for the diver symbol. This underwater handyman will bring in up to 2000 times your line bet if you spin two or more across an active payline. There are a couple of other symbols to help you in your quest for cash, including sharks, treasure chests, A, K, Q, J, 10, and 9. You’ll encounter plenty of surprises while you’re cruising through the depths of the ocean, including the fantastic bonus feature. If you can spin the submarine and the logo on the board at the same time, you’ll trigger a bonus game that will see you pulling in plenty of big wins. So, join Captain Nemo in his underwater adventure and you could see yourself finishing the night with plenty of cash! 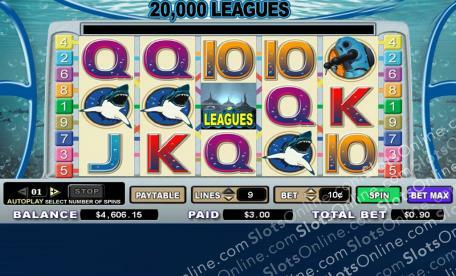 There are two wild symbols in this game: the submarine and the 20,000 Leagues logo. The former only appears on reels 1, 2, 4, and 5. The latter only appears on reel 3. Both will substitute for all other symbols to help you bring in more wins. The 20,000 Leagues bonus feature is triggered when you spin one or more submarines along with the 20,000 Leagues logo anywhere on the board. You will be awarded 10 free spins for every submarine that appears in the triggering combination. Prizes are doubled during these free spins and they can be retriggered.